Joel Minas covers "On Love: Eros" in YouTube video. It's unsurprising that hit figure skating anime Yuri!!! on ICE would inspire real-world figure skaters in their choreography, and it's something special to see them bring the show to life on the ice. 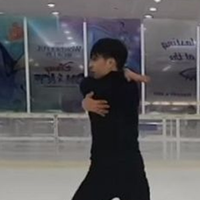 Joel Minas, an amateur figure skater/IT guy from the Philippines, decided to share his passion for skating and his love for the series with YouTube in his latest video: a "cover" of Yuri Katsuki's piece "On Love: Eros." Check out that final pose. Since uploading his video, Joel's seen his subscriber count rise to above 11,000 and still climbing. Fans from all over the world are sharing his video and his love of the show with each other. Make sure to check out the rest of Joel's videos, where he showcases some of his other skating moves. Crunchyroll Movie Night: Yuri!!! on ICE Marathon Tickets On Sale Now!